In the past five years or so there has been an increased demand for electrical energy in North America. Due to the increased demand, coupled with deregulation, many energy suppliers have purchased and/or commissioned a significant number of new turbines. In addition, many older machines have been recommissioned or are being used as base load machines. The current condition of the turbine oil in service may be (or should be) in question. These new operators range from old established energy providers to new companies meeting the energy challenge. As would be expected, the energy providers’ knowledge of lubricants and lubricant-related issues ranges from highly skilled to novice. The intention of this article is to clarify the positives and negatives of reclaiming and refortifying turbine oils and to point out the significance of getting it right. Before we get started, a discussion of the terminology used in this article is in order. Reclamation refers to cleaning and reconditioning of a lubricant, thereby rendering it suitable for continued use in the same application for which it was originally formulated. In the industry today, reclamation normally refers to the removal of water and solid particles from the lubricant. Refortification refers to the act of adding a predetermined amount of additive to a clean, dry, used lubricant to replenish some of the depleted additives. In most cases, refortification and reclamation are used together. To answer a commonly asked question: the process of reclamation or refortification will not effectively remove spent additive materials, soluble oxidation products or any other species that readily dissolve into the turbine oil. Currently, some companies are working on processes to remove some of these materials, but commercial units are not available. Recycling a lubricant usually involves using a spent lubricant in a different, less critical application than its original purpose. An example of this would be using spent engine oils for secondary fuel in a cement kiln. Another form of recycling is re-refining where, through a series of process steps, the used additives and contaminants are removed from spent lubricants to produce re-refined base oils. Formulating turbine oils is not a difficult science; however, it does require a delicate balance of the correct additives and base oils. In today’s market, most turbine oils are formulated with API Group II base oils and contain less than two percent additives (Figure 1).The addition of oil soluble foreign materials to the product can upset the balance of the formulation, and adversely affect product performance. At first glance, one would think that the quality of turbine oil in a newly commissioned turbine is a nonissue and the oil should last for its designed service life; however, this is not always true. In some cases, to reduce costs, contractors select turbine oils which meet only minimum original equipment manufacturer (OEM) requirements for the application. These products can have a reduced service life as the oil undergoes thermal and oxidative stresses. In some cases, this may require change out or refortification of the turbine oil in less than three years of service. In addition, it is an OEM-recommended practice to flush new turbines with the original charge of oil. After flushing the turbine, the oil is reclaimed. The particulate and water contamination are removed, and the oil is retested to ensure that it meets the original OEM specifications. In general, the practice of reusing the flush oil as the system lubricant for the new turbine system is discouraged. While particles (dirt, scale, welding slag, etc.) and water contamination are easily removed by reconditioning (vacuum dehydration and filtration), other contaminants can enter the turbine oil during the flushing process. These contaminants may include: hydraulic oil, grease and metal preservative materials, and will readily dissolve into the turbine oil and become part of the formulation. No commercially available process on the market today can remove the latter contaminants. The addition of these contaminants to turbine oil formulations can negatively affect long-term product performance and may result in system deposits, varnish, lubricant foaming, degradation of water separation properties, etc. Therefore, when commissioning a new turbine, it is suggested that only flush oil be used to clean the system. If more than one turbine is being constructed, the flush oil can be reconditioned and used again as a flush oil in a different turbine. At the end of the project, the flush oil should be discarded, recycled or used in noncritical applications. Reclamation or the removal of water and particulate contamination from oil products is fairly straightforward and can be easily accomplished. Water can be removed from turbine oils via reservoir settling, vacuum dehydration, centrifugation or coalescing. Methods to reduce particle counts include: reservoir settling, mechanical filtration and electrostatic filtration. These methods are effective in removing contaminants, and they do not significantly reduce the additive content of the reclaimed turbine oil. However, it has been the authors’ experience that surface-active additives, such as antifoamants and/or demulsifiers, can be selectively removed from oil formulations. These materials are not filtered out, but tend to accumulate or plate-out on filter media surfaces. The removal rate is relatively slow, so over the life of the lubricant, these additives can gradually be depleted from the formulation. Therefore, properties such as foaming characteristics and water separation should be monitored over the life of the lubricant. Refortification or the addition of additives to the turbine oil is much more difficult and requires knowledge of the formulation. The need for this knowledge should not be underestimated. Turbine oils are balanced formulations designed to provide optimum performance. The addition of different additives to the used turbine oil may result in an imbalance in the formulation that could adversely affect performance. Another refortification problem manifests itself with base oil issues. Turbine oils formulated with API Group I base oils have different solvent characteristics than newer Group II base oils. The addition of the wrong type of additive to a used turbine oil might result in additive insolubility. These imbalances can result in additive dropout and/or the formation of reaction products, and can result in system deposits, varnish and filter-plugging problems, etc. In the case of reclamation and refortification, it is important that the equipment used to perform these operations be cleaned prior to its use. In some plants, reclamation equipment is portable and cross-contamination with other fluids is a real concern. Experience has proven that contamination will occur unless operators are acutely aware of contamination issues and the types of problems that can arise if proper precautions are not taken. If a situation which requires the services of an outside contractor arises, make sure its equipment is clean. Before processing turbine oils, always flush the equipment thoroughly with the product to be processed or with fresh clean base oil. In addition, it is strongly recommended that all mechanical filters be changed to avoid cross-contamination. The main objective is to keep the reclamation equipment clean to prevent cross-contamination. Also, when using an outside contractor, it is recommended that the job be done on-site and the contractor not be permitted to remove the oil to an off-site facility. Once off-site, the opportunity for contamination of the oil with other fluids increases. Depending on the performance level desired, turbine oils are formulated with different additives to enhance performance. Along with proper base oil, these additives will offer good resistance to oxidation, inhibit sludge formation, protect system components and have adequate surface properties. The factors that affect oil service life vary, but the properties of new turbine oils are expected to degrade over the life of the product. Thorough and routine testing of the turbine oil will determine when the properties have changed significantly to warrant corrective actions. ASTM D4378 Standard Practice for In-Service Monitoring of Mineral Turbine Oils for Steam and Gas Turbines2 is an excellent starting point to develop your monitoring program. 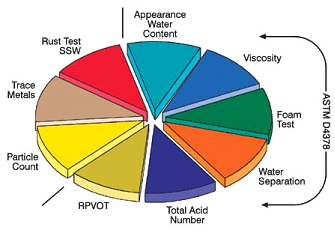 Tests that are normally conducted on used turbine oils are listed in Figure 2. Depending on the application, the ultracentrifuge test, Fourier transform infrared (FTIR) analysis and a simple filter patch test may also be added to the testing schedule. When the monitoring program detects high water content (in excess of 500 ppm) or particulate contamination (depends on OEM and user requirements), quick action is required. The circulation of these contaminants through the turbine can irreversibly damage equipment parts and cause operational problems. Reclamation is straightforward and can easily and effectively remove water and particle contamination. However, corrective actions should also be taken to identify and correct the source of these contamination problems. When the monitoring program detects other deficiencies, excessive foaming, low rotating pressure vessel oxidation test (RPVOT), poor water separation properties, etc., refortification of the turbine oil may be in order. As stated earlier, refortification is difficult and requires knowledge of the turbine oil formulation. Trying to refortify another supplier’s product is risky business, because the formulation may contain additives that are not compatible with the additives that are used to refortify the turbine oil formulation. To correctly address the problem, a series of laboratory blends will need to be prepared to determine the proper concentration and the appropriate additives to add back to the formulation. An effective testing program will include compatibility and stability testing. These are needed to prevent the overtreating of additive components, which can result in additive instability and/or dropout, resulting in filter plugging, system varnishing and deposits. The method of adding the correct additive, in correct amount, back to the formulation is critical. Most additives have solubility limits in base oils and/or are more viscous than the turbine oil; therefore, they should be completely and thoroughly mixed into the formulation. It is suggested that the equipment have inline blending capabilities when adding additives to the used turbine oil. This equipment will slowly add the appropriate amount of the additive back into the used turbine oil. The tank-side addition of the neat additives or additive slurries is not recommended, because it could result in additive “slugging” or dropout of the additive in the bottom of the reservoir. Once the job has been completed, a post sample should be taken and tested to ensure that the blending of additives into the used oil has been accomplished and the expected results have been obtained. Turbine oil reclamation and refortification require knowledge of the condition of the oil, capabilities of the equipment, and the formulation. Provided these processes are performed correctly, they can be beneficial and can greatly extend the life of the turbine oil. Also, given the complexities of the steps required to refortify the used turbine oil, partnering with a trusted supplier and/or contractor could be beneficial. McNeely, M. “The Coaster Ride Continues Downhill.” Diesel & Gas Turbine Worldwide, October 2003. Designation: D4378-97. “Standard Practice for In-Service Monitoring of Mineral Turbine Oils for Steam and Gas Turbines.” Annual Book of ASTM Standards, Vol. 05.02, 2002.